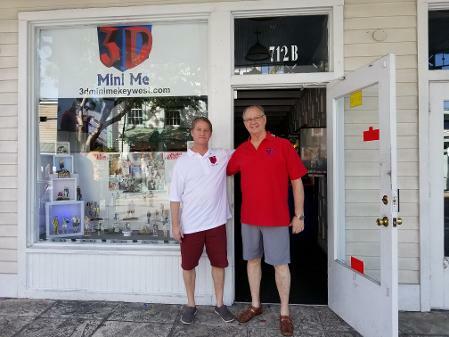 The original idea to make mini me's started in 2013 when I was part owner of Key West Gallery in Key West, Florida. I had this idea to make little bronze sculptures of people. My favorite artist is Bill Mack, he is a world renowned sculpture and relief artist. He mainly did sculptures of female models in bronze and the only trouble I ever had selling his work was a couple would come in and say I love the sculpture but it’s not my wife or girlfriend. I thought what if I could create the actual person using a 3-D printer, but to do it life-size like he was doing would take forever and cost too much. That's when I decided to shrunk everything down and make miniatures. We started by using printers that used plastic filament in one color until I had an artist show me how to put a bronze finish on each piece. This is a picture of my first 3d printer below. We started creating bronze bust of a single or a couple like the baby shoes used to be. We did this for about four months until we started doing them in color on a full color 3-D printer. Below is a picture of a Bill Mack's bronze. I started scanning friends and family with a xbox 360 scanner. I hand made a turntable that would spin as I pulled a string and the scanner moved up a pole at the same time, I spent weeks and weeks trying to perfect it but could never get it to work with the scanner. I then bought a motorized turntable and motorized arm for the scanner, this came with no instructions and we even had to learn G code to make the motors work. After months of trying and trying we could not get the scanner to work with any type of turntable. After all that work we found we had the best results with the hand held scanner without a turntable. After months of practice I found the best way to get good scans, so I would practice scanning on anyone who came to my house. Almost everyone said it was really cool idea but nobody thought it would work as a real business. I had some believers but most people said I was crazy. It took awhile for my son Chad to get interested because he had a good job and not much free time. Chad would come over and help when he could, eventually we learned how to get good enough scans to print on the 3d printer. 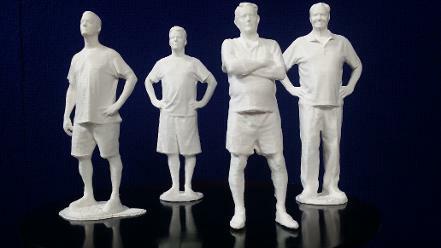 The first mini me's were made of PLA plastic on a regular 3d printer using only one color. We did most of the early pieces in white plastic and they looked almost like porcelain. The big breakthrough came when my Nephew Jordan came to visit with his girlfriend Heather. I asked if I could scan them, Jordan sat down next to Heather put his arm around her and said "sure scan us together". At that time I had never scanned 2 people at the same time and I really didn't think it would even work but I said OK lets give it a try! That scan turned out to be one of the coolest scans ever and with two people cuddled up together in a little sculpture I knew people would love to have one of themselves. Picture of our first location in 2015 at Clinton Square Market. I started making the bronze finish mini me's in 2014 after a good friend and artist Steven Muldoon showed me how to apply a bronze finish. This was a long process of applying paint and waiting days between coats of paint, but the finished pieces really looked like bronze. 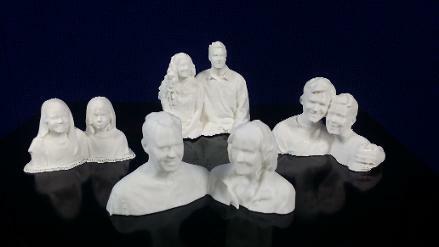 We opened the business in 2014 selling only the plastic bronze finish mini me's. Every mini me took about 4-8 hours to print, then about 3 -5 days to apply the bronze finish. The original mini me's came with a certificate including the print time, layer count and filament length. The full color mini me's came available in 2015. We had been experimenting with different editing programs and trying to figure out how to print in full color, at that time there was no help available online or even from the printer company. We just keep trying and trying until we finally figured it out. I still have the first piece we printed in full color of myself, we were actually surprised when it came out in full color. From there we put it on display and almost immediately started selling the full color mini me's just off that one sample. The first color mini me was sold to a woman from France, when she asked the price I had to just guess and I think I said $150 for the 5 inch size. From there we knew we were on to something. We continued to sell the full color mini me's and would reprint samples for the store when we could. At that point we had to figure what sizes to sell and for how much. We have now sold over 7000 full color mini me's in less than 3 years.